Description: After publishing many large Java Database Application in my Website, this time for end of 2016 I developed a small Java Program to Find the day of the week of a given date. I find this problem at http://www.home.hs-karlsruhe.de/~pach0003/informatik_1/aufgaben/en/flowcontrol.html#day_of_week. There is a solution for this problem in that page, but I designed and developed my own solution as you see below before I looked at their solution for the problem. 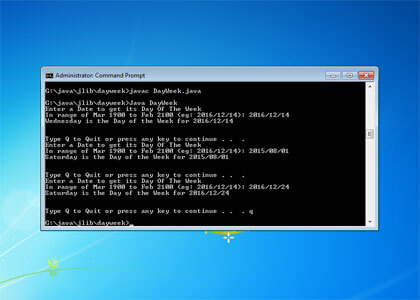 Implement a Java-method that prints out the day of the week for a given day (1..31), month (1..12) and year. Add the missing leaps years by adding (year - 1900) / 4. If the year itself is a leap year and the month is January or February, you have to subtract 1 from the previous result. Now add the all days of the year up to the given one to the result (in case of february always 28, because the additional day for a leap year already have been added). 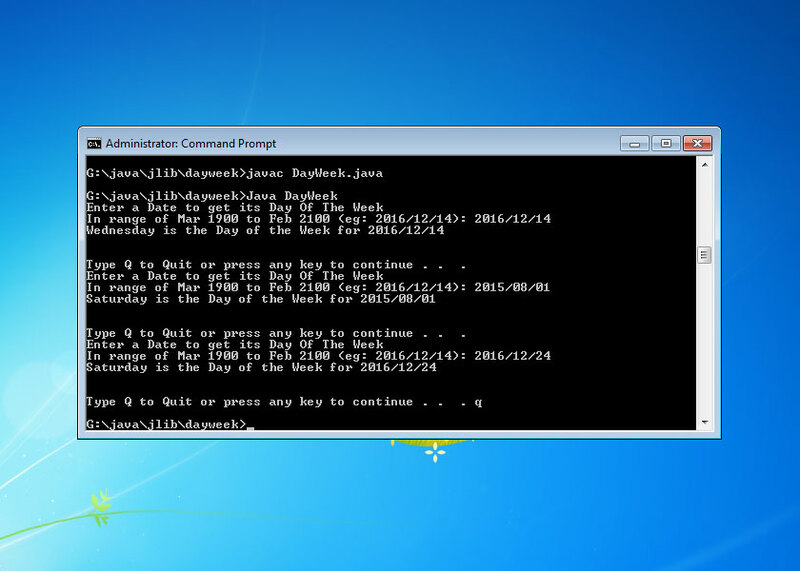 C:\javacodes> javac DayWeek.java "compiles the DayWeek class"
C:\javacodes> Java DayWeek "and to run it"